To honor IV Nurse Day, which is held annually on January 25th, we decided to ask an infusion nurse what it’s like to work in that part of the field. Pamela Jacobs, MHA, BSN, RN, CRNI, OCN, the director of clinical education at the Norton Cancer Institute, Norton Healthcare, in Louisville, Kentucky spoke with us to give a glimpse into the working day of an infusion nurse. As an infusion nurse, what does your job entail? What do you do on a daily basis? Infusion nurses have a great deal of responsibility ensuring patients receive safe, quality infusion care. The infusion nurse is an integral member of the health care team and collaborates with physicians, physician assistants, nurse practitioners, and pharmacists to ensure the vascular access device and treatment used are best suited to the patient’s needs. 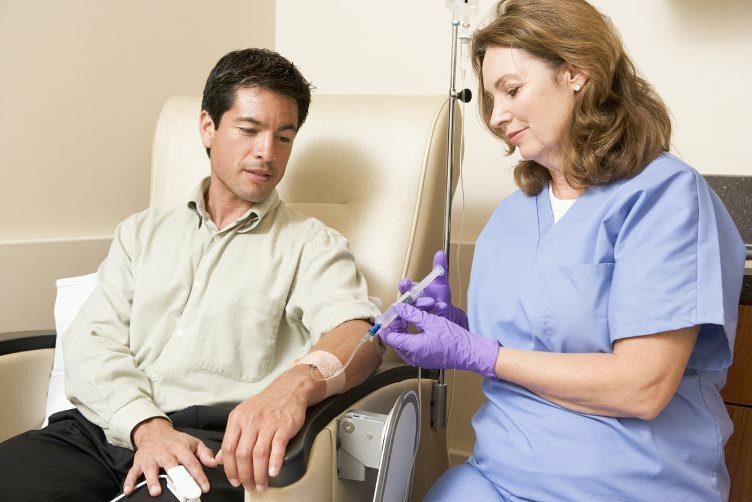 The infusion nurse administers various therapies such as intravenous antibiotics, chemotherapy, immunotherapy, blood products, and performs procedures such as therapeutic phlebotomy and placement of central access, midline, and peripheral IV catheters. They also care for and maintain the devices to prevent and manage IV-related complications. The infusion nurse is a valued resource to staff for education and to materials management for product evaluation and selection. An infusion nurse is employed in different practice settings: hospital, outpatient ambulatory, infusion centers, home health, long-term facilities, and administration. As a director, I am focused on the outcomes of patients. I serve on a Central Line-Associated Bloodstream Infection (CLABSI) Team and the System Infusion Therapy Matrix Team, where hospitals in our system come together and discuss issues related to infusion therapy. This team ensures that IV therapy policies and procedures reflect current Infusion Nurses Society (INS) Infusion Therapy Standards of Practice. Why did you choose this field of nursing? I became an infusion nurse because of the influence of another nurse. She convinced me that becoming specialized in infusion nursing would be an asset to our organization. She also encouraged me to become certified in the specialty of infusion nursing, further validating my competence and skill. To maintain consistency and standardization of practice among nurses. Nursing is both an art and science, and nurses look to evidence to support what they do. While the art of nursing allows for some variation, in infusion therapy adhering to standards and integrating the best evidence into practice will achieve the desired outcomes. Recognizing the value infusion nurses/teams bring to a health care organization is another challenge. While most patients in the hospital will have an IV at one time or another, it’s imperative that all clinicians understand the risks of infusion therapy. Complications can be local, such as phlebitis, or life-threatening due sepsis from a CLABSI. It’s been demonstrated that infusion teams can have a positive impact on an organization’s fiscal bottom line. Another challenge is establishing and maintaining competency in an ever-changing health care environment. All nurses must be prepared as our patients are sicker, living longer, and more complex technology is being used. The greatest reward of infusion nursing is serving patients and their families. During our work, the procedures we perform may cause anxiety and pain. Being able to put our patients at ease and deliver the care they need is part of what we do every day. Many of our patients require long-term therapies, so developing trusting relationships is key to their treatment plans. What would you say to someone considering this type of nursing work? The scope of infusion nursing is broad and requires both knowledge and skill. With education and hands-on experience, expertise can be achieved. It’s a specialty where nurses care for all patient populations—from neonates to geriatric patients—in all practice settings. It also offers autonomy in one’s practice. However, great responsibility accompanies that due to the risk associated with the specialty. The knowledge, skill, and expertise that infusion nurses possess, coupled with their passion and commitment, lead to the safe, quality care our patients deserve. For more information and resources on infusion nursing, go to the INS website at www.ins1.org.